- Specially designed pedal-operated spin system uses centrifugal force to squeeze out all the excess water so that your floors dry faster and without drips or streaks. 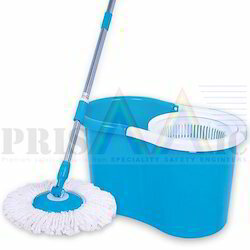 - The super-large, 360 degree rotating mop head allows you to cover more surface area and reach those difficult corners with ease. - Colours : Green/Red/Blue-Actual color shipped will be as per availability.